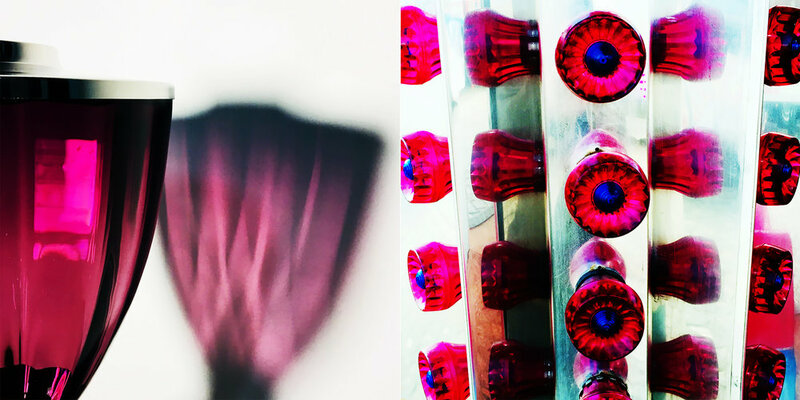 There are many possibilities for glass productions but in the end, it´s about the quality of the mould. You can use wood, graphite, different kinds of metal and of course, each material has its special properties and advantages compared to the others. Usually, wooden moulds are used for tests and small quantities but not all designs are possible here with this material. Metal moulds are used for higher quantities and more stable productions. However, there are glass blowers who only work with wooden molds as for the special and natural appearance of the results and the handmade character you get by using them. We are going to make some tests soon with new high tec materials to enable better surfaces and more stable tolerances for our products. We are curious about the options and results. We think that you might like it if we will come up with a TORR TOYS "MOOD BOOK" soon. You can see the first results In our GLASS BLOG now. In addition to that we try to find some natural and organic patterns where we will check the possibilities to transfer them into our glass designs. We are really curious about this experiments. 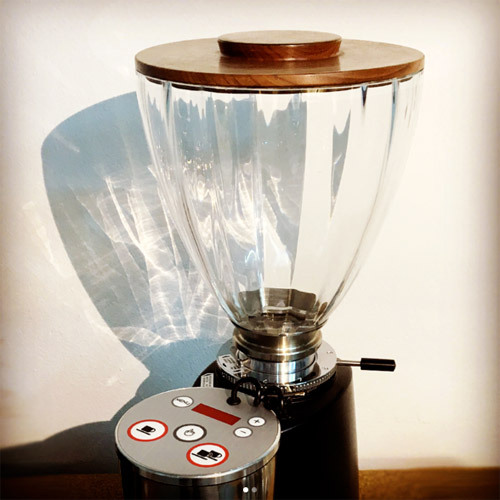 The "King of the Grinders", the Mahlkoenig K30 PEAK will have another hopper option soon. This new glass size will be to hold approx. 1KG of coffee and can be also used for all the other standard adapters of course. The upcoming 1 KG size hopper will be designed to match the amazing Mahlkoenig K30 Peak, and all the other K30 models, in the best possible way to get a beautiful all-over design with that round and short body. The hopper will be little taller than the 600 size but with a wider diameter on top and a different shape. The total height of the MK30 should be 50 cm max. in the end. With this 1 KG, we will also offer special limited editions for the PEAK grinder. We expect the new design to be ready after the summer break in September latest. After a break of some years, we start again with wooden lids for the Glass Hoppers. 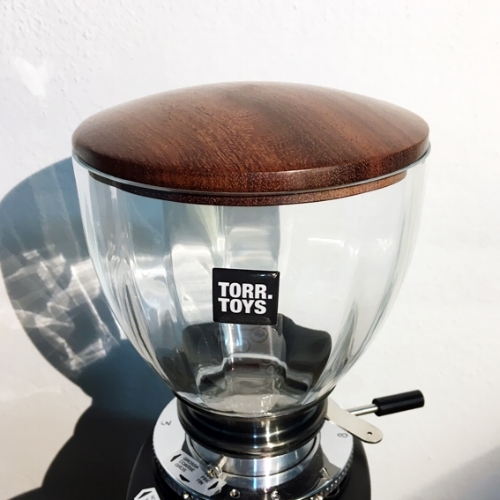 We are busy to develop two new designs in the beginning which will be the perfect match for the hoppers and a good alternative to the standard metal lids for those who prefer wood or also have wooden panels mounted to the espresso machine. The wooden designs will be different from the metal lids for sure and we expect timbers like Palisander, Walnut, Zebrawood, and Maple, maybe some European hardwoods also. As for the handmade glass which always shows a different inner diameter at the upper side of the glass, we need to work with O-rings or gaskets here in order to reach the right fit. Also, individual lids are possible. Final versions will appear soon.